The DF1706 is a high performance, stereo, 8X oversampling digital interpolation Filter designed for high-end consumer and professional Audio applications. The DF1706 supports 24-bit, 192kHz operation and features user-programmable functions, including selectable Filter response, de-emphasis, attenuation, and input/output data formats. The DF1706 is the ideal companion for Texas Instrumentss PCM1704 24-bit Audio digital-to-analog (D/A) converter. This combination allows for the construction of very high-performance Audio systems and components. 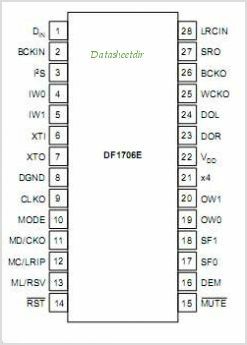 This is one package pinout of DF1706,If you need more pinouts please download DF1706's pdf datasheet. 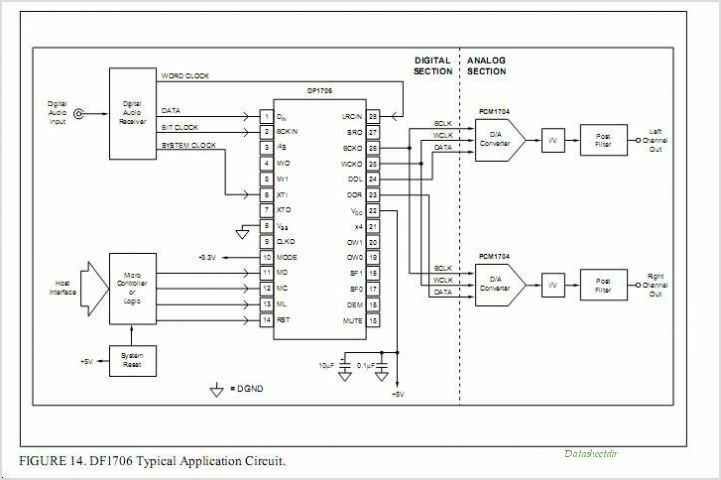 This is one application circuit of DF1706,If you need more circuits,please download DF1706's pdf datasheet.